Mr Mouse is working behind the counter today - Hello Mr Mouse! Little Sprig browses the shelves. There are lots of things to choose from. She bumps into Charlotte Rabbit, who is choosing some carrots for supper. Hello Charlotte Rabbit! Little Sprig chooses some bread and cheese to make a nice lunch for herself. Mr Mouse rings up the bread the cheese in the till, and puts them into a bag for Little Sprig. He even thows in a free leek for Little Sprig! And Little Sprig takes them home for a delicious lunch! Little Sprig - bread and cheese for lunch! Oops, forgot to put Charlotte Rabbit into the picture. Here she is. Maileg Charlotte Rabbit - £25. I have been selling Moulin Roty toys for 12 years now. I still remember the first ever delivery back in 2003 - it came to my home (then a little cottage in Oxfordshire) and I remember unpacking the Grand Family animals. I didn't even know their names back then but oh how times have changed! The Moulin Roty range has also changed over the years. Like all companies, they need to keep things fresh and interesting, which means they introduce a new range or two every year. Which is great! BUT sadly, this also means that a range or two has to be 'dropped' or discontinued. Sometimes the discontinuations have really surprised me - ranges that seem to do so well! - but we must remember they are naturally led by the French market, and sometimes the ranges that do well here in the UK, just one of their export territories, don't perform so well elsewhere. And for those desperately trying to track down old toys, the very best place to try is the French ebay site - www.ebay.fr - they have lots of older stuff on there. A lovely safari range of lion, giraffe, monkey and elephant. 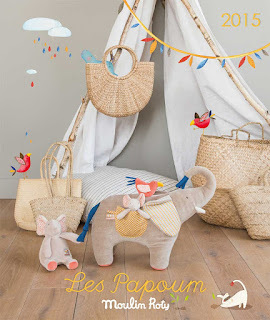 Happily Moulin Roty have just introduced 'Les Papoum' a new jungle range for 2015 which shares some characters. Bright strong colours and quirky magical characters - Dragobert himself was a dragon but his little clown / jester friends were also very popular. Louna the bee and lots of little insect friends. Bright, fresh colours - greens and pinks and oranges. Popular for years and apparently a big big hit in France so not sure why this one went... but everything changes. Not around for that long, but I always loved this range as it seemed so very French to me. Classic navy and silvery grey - doll, rabbit, mouse. I suppose it was rather grown up, but I loved it. Two cheerful beret wearing mice, grey plush and bright cheerful outfits.There was also a lovely turquoise hen who outsold the mice at Cottontails. A lovely blue and yellow collection of rabbit and mouse. Gosh I remember selling lots of this when I first opened my little high street shop, so we're talking well over 10 years ago now. An insect collection - crickets and dragonflies and ladybirds. The real big seller for me was the ladybird on a leaf comforter. A doll and a dog. It's funny, this range never really took off at Cottontails, and yet after it was discontinued I had so many requests for replacements. People must have been buying the originals somewhere else! One of the things that drew me to Moulin Roty in the first place was their *amazing* range of lovely quality French toy crockery. They still do a couple of bits, but nothing like the entire kitchen they used to make. I have some bits at home, I use them in my kitchen. And Rudolph rabbit often has his dinner on a miniature fruit stand! Limited edition rag dolls - Gaspard was the boy, TingTing and Suzanne the girls. Gaspard didn't do that well and was replaced by Rosalie. They only made so many of the them at a time (was it 5000? I can't remember) and they came in a lovely box. I always called this range the 'long legs' because they were so dangly, and I can't for the life of me remember their official name! Anyway, whoever they were, there were three of them and I do remember their individual names - Polo. Gege and Momo. Well there we have it, a little trip down memory lane. This is not completely comprehensive, even as I type and assemble images other toys are coming back to me... there was a range called The Stray Bunch I think, and Paul et Virginie... but I'll be here all day if I keep going! Every year Moulin Roty introduce a new nursery range, and for 2015 they have created a lovely new jungle themed collection. Meet Les Papoums - released June 2015. An elephant, hippo and lion. Colours are muted, with lots of soft naturals, but there is a lovely blue running through the hippo characher, and splashes of warm reds, yellows and oranges pop up here and there. Those of you who are long standing fans of Moulin Roty will remember 'Les Loustics', their safari range from a few years ago (lion, giraffe, monkey and elephant). I was sad to see that one go (and still get asked for the comforters) so am delighted there's a new, fresh collection of more exotic animals available. As ever, the range includes soft toys, rattles, comforters, musicals, slippers and activity toys, and here at Cottontails I am stocking the lot! You can see the range here - and please do email me if you have any questions. I just couldn't resist! And anyway, this is hardly fine-delicate-jewellery-shop-type jewellery - these are sweet, funny, quirky little pieces, and in that sense they fit on pretty well at Cottontails. I have admired Just Trade jewellery for years now, smiling whenever I wandered past their stand at trade fairs or their brochure dropped into my inbox. I even have a rabbit necklace of my own from them. And what is more, Laura at Just Trade has rabbits of her own - a kindred spirit! I am starting with a couple of veggie and flower brooches, a crochet guinea pig and rabbit, a rabbit pendant carved from a nut - oh and a couple of hand knitted baby things. You can see them all on the website here. What is more - and as the name implies - Just Trade is not just another gift company. It is a small, ethical, fair trade project. It has real heart. Each range they produce has a story behind it involving real people, and real change in people's lives. Oh one last thing - I read a lovely customer review on the Just Trade webiste for the bunny brooch. It made me smile because it's the kind of thing my customers write - only I don't get many male customers. But here it is... what a star this husband and dad is! "Bought two of these at Easter - one for my wife and one for my 2 year old daughter. And made my two ladies very happy indeed. Such a perfect little gift. Really great quality, funny, durable (if they get left on for a wash by accident! ), and very sweet design. I think the Just Trade broaches are a really special way to let someone know you're thinking of them."